There are countless choices available today for window treatments, which may be confusing at first glance. 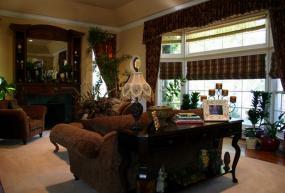 There are two main families of window treatments: hard and soft. Each of these categories breaks down into several options that can complement many styles of room. Depending on the decorative and functional needs of your room, hard and soft window treatments can be used alone or in combination with each other to create the perfect look. Hard window treatments can help block more light and give a more permanent look to an area. Blinds are offered in numerous forms such as Venetian (or slat blinds), mini blinds, verticals and woven wood. The two most fashionable trends in this category are wooden slat blinds and woven wood blinds. Wooden blinds are generally constructed of horizontal wood slats about 2-inches wide and come in a wide selection of stain colors. A popular variation on the wooden blind is a faux wood blind made of synthetic materials that simulate wood. Woven wood blinds consist of split wood or bamboo and are interwoven with fiber or yarn. 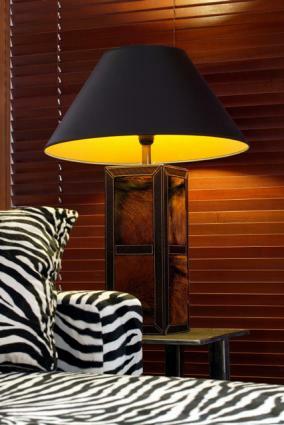 This exotic look is becoming more mainstream and can enhance traditional or contemporary rooms by adding subtle texture. Blinds can work well in nearly any room of the home. Incorporate them into various living room designs to add texture to a window design. Shutters are a classic window treatment that is still in high demand and not likely to go out of style anytime soon. Due to their detailed installation, shutters can be one of the most expensive hard window treatments. Shutters can be built with wood or faux wood materials, and they provide excellent insulating value. Shutters work well in sunrooms, as well as brightly lit breakfast nooks or paneled dens. Screens are another hard window treatment. This style of window treatment includes Japanese-style shojis and grills. Shoji screens are wooden frames with rice paper panes that permit light to gently filter into a room while providing privacy. Shojis are suitable not only for Asian themed rooms, but also for minimalist and contemporary interiors. Grills have a long history in both Spanish and Middle Eastern window designs. These pierced or grillwork screens employ striking patterns and a variety of metallic finishes. Screens work best in living and family room areas. Make sure you have plenty of access room around the places you want to install these, as they will need to be lifted in and out. Specialty glass encompasses window treatments such as stained glass, beveled glass, glass blocks, frosted glass, and liquid crystal technology. Stained glass is particularly useful for a window that has an undesirable view or for a window that is not likely to be opened on a regular basis. Custom stained glass windows can be permanently installed or a framed piece can be hung on top of an existing window. Liquid crystal technology allows a window to change from clear to opaque with the flip of a switch. These pricey modern marvels use liquid crystal droplets and electricity to achieve this effect. Use specialty glass in formal entry ways and living rooms. Keep in mind, however, that they can obscure the view and dim the light, so avoid them in dining or kitchen areas. Soft window treatments include several materials that will give your room a completely different look. Draperies are heavy fabric panels which help regulate a window's privacy, light and temperature. They are usually installed with a traverse rod which draws the drapes across the length of the window. A less functional yet very chic option is the fixed drapery panel which remains at the sides of the window and mainly serves to beautify the room. Curtains are very similar to draperies, but are made with lighter weight fabrics which are more casual and mostly just decorative. Draperies work well in any room. With their heavier material, they add privacy to bedrooms or living rooms as well as any areas off the front of the home. Shades are increasingly popular and include Roman shades, Austrian shades, pleated fabric shades, roller shades and interior sun control shades. Romans are very versatile and can be flat, hobbled or pleated. This shade softly folds horizontally as it is lifted up by a cord. Interior sun control shades began as a commercial application (you may have seen them in your favorite restaurant's windows). Sun control shades have the unique feature of reducing glare and heat without blocking sunlight or your view of the outside. Add shades to bedrooms to help control the amount of light that may disturb sleepers. Valances are non-functional window treatments that adorn only the top portion of a window. The shape of valances can be fashioned into swags, cascades or jabots. A variation on valances is the cornice top treatment. Cornices are assembled pieces of wood, metal, or foam which are custom shaped and then typically covered with fabric. Valances work well in kitchens, such as the window above the sink that doesn't need privacy, just some decoration. They also combine well with draperies for a more formal look in living rooms. No matter what style of window treatment you select for your home, proper measurements are the key to ensuring the right look. Once you decide on how much light you wish to block and what style of window treatment you are after, be sure to measure the windows from all angles. This will help make sure you get the fit and the look you're after the first time.